I'm in Mongolia. Just had to buy the solar powered dashboard prayer wheel. The instructions alone are worth the $5 price tag. 1. Jìnzhǐ yònglì qiángzhì zhuǎndòng jīngtǒng. 2. Tàiyángnéng jìngpiàn jí dǐzuò biǎomiàn rú yǒu huīchén, qǐng yòng gānzào qīngjié bù qīngqīng cāshì. Qiè wù jiā rènhé qīngjié jì cāshì. 1. Do not use force to rotate the scripture cylinder. 2. 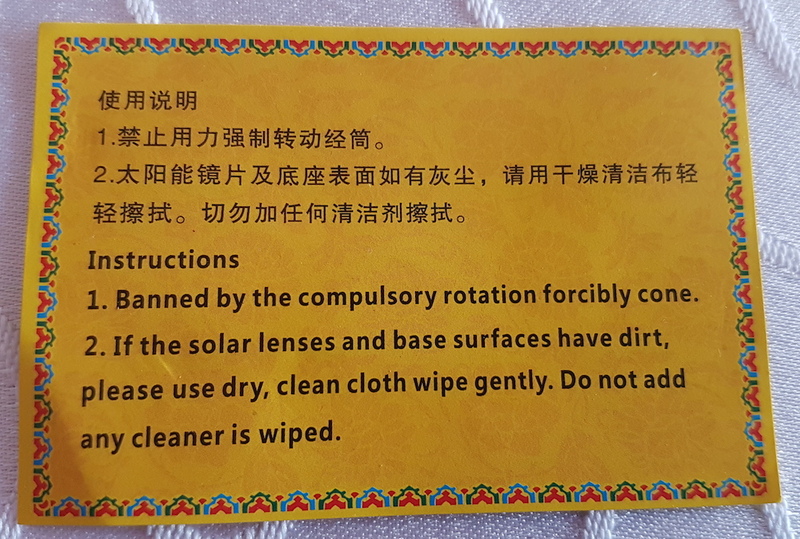 If the solar panel and the surface of the base have dust on them, please wipe them gently with a cleaning cloth. Under no circumstances should you add a cleansing agent when you wipe them. I will let the longer English text stand on its own as a marvelous specimen of mystical machine translatese, with all of the spiritual whimsy that it conveys. The concluding portion states that use of this contraption will enable its owner to "lěijī wúliàng gōngdé 累积无量功德" ("accumulate immeasurable / infinite merit"). Although purchased in Mongolia, this quaint objet d'art was undoubtedly made in China. The Tibetan is impeccable except for one typo. It describes the wheel as "rang 'khor" ("self turning"), which refers to the fact that it is solar powered. Traditionally, such prayer wheels would have been powered by water, wind, or the movement of the hand. The Tibetan seems to have been independently composed. It says the wheel has mantras inside and describes the benefits of turning it: longevity, health, fortune / success, fulfilled wishes. That is also the gist of the last sentence in Chinese (and English) of the trilingual page, but the Tibetan has things the Chinese doesn't (like the final ‘tashi delek’, for which see below), and the syntax is quite different. 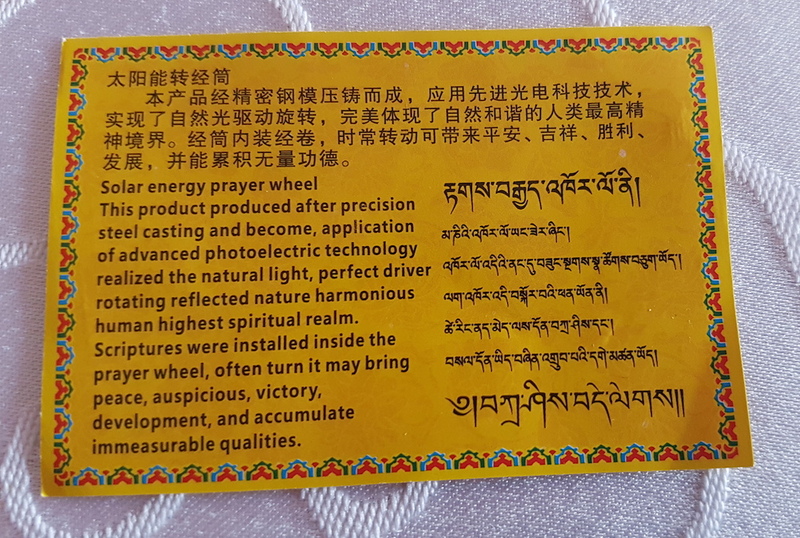 Interestingly, only the religious part of the text is in Tibetan, while the instructions on the use and upkeep of the device are only in Chinese and Chinglish. I used to have one of these on the dashboard of my old car! I got mine in Chengdu. These are very popular on cars there and on the Tibetan plateau. The Tibetan does not appear to come from the Chinese; it is different. I think rang ‘khor (self-turning) sounds right. The outside of the box says “self-turning maṇi” . This is also called a ‘maṇi wheel’. Many retention mantras (bzung read: gzungs) have been put inside this wheel. Dispelling [obstacles]. It is a good sign for wishes fullfilled. bzung sngags does not make sense, but gzungs sngags is a type of mantra (gzungs on its own also means dhāraṇī). It is common to misspell bzung/gzung(s) with a different prefix or by dropping the second suffix. It is interesting that the text also refers to it as a hand-wheel (lag ‘khor) in the note, as it is about the size (or smaller) of the hand-held prayer wheels that are common amongst Tibetans. I have seen water-powered wheels in Tibet as well as solar powered “self-turning” ones of various sizes. The English convention of using “prayer wheel” for this adds prayer; there is no word “prayer” in the Tibetan, just maṇi (jewel), which is of course short for Avalokiteśvara's mantra: oṃ maṇi padme huṃ. On a related note, the popular English translation of Tibetan “prayer flags” does not include the term “prayer” either: the Tibetan term is “wind-horse" (lung rta). All in all, Harry made a good investment. 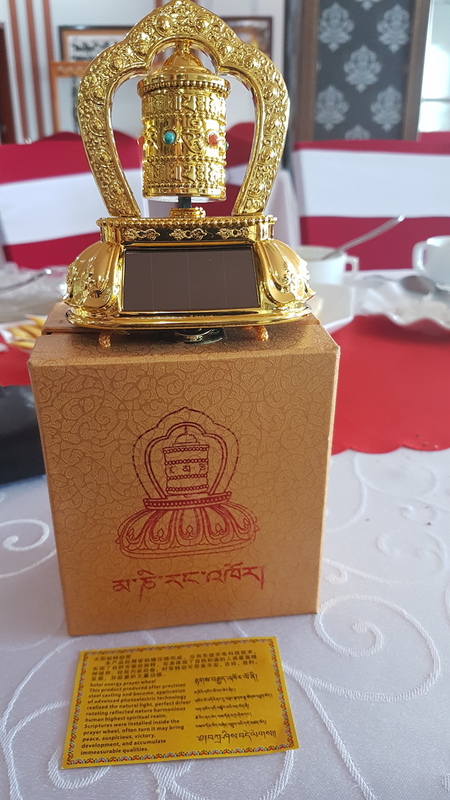 Not only does he have an attractive, intriguing decoration for the dashboard of his car, he will accumulate much merit while he is driving, so long as he keeps his eye on the road and not on the glittering, self-turning prayer wheel. The box has the name "Mani self-turn", which must be a way of saying "automated mani wheel". I can't judge the quality of the language, but it seems clear and modern to me. There's one word "bsal don" that I think might be spelled incorrectly, but you'd need to ask others about that. See Google Images for "Dashboard Jesus". Haha. I've had one of these on the dashboard of my truck for a couple of years. The instructions, which I have unfortunately lost, have a version of "Do not use force to rotate the scripture cylinder." which was phrased in an incomprehensible way. Now, this Made-in-China Tibetan prayer wheel needs to be started by force even in strong sunlight. Then it sends Om Mani Padme Hum up to the heavens reliably if I'm headed in the right direction. Those solar cells wear out. Oh, on review: the instructions: "Banned by the forcibly rotation cone." I kept thinking about Robert Frost's poem, "An Importer". Mass producing with a vengeance. Teach those Asians mass production? Teach your grandmother egg suction." I cannot help but wonder in which topoloect(s) "engines" and "vengeance" are rhymes.